I suspect only Bob is more grateful than you to see I've come to the end of the broccoli trilogy. My final effort is patterned after a dish we had in Hong Kong several years ago. Before I get too far into the recipe, I want you to know that Hong Kong is an extremely cosmopolitan city where you can get any type of food you crave, including pizza and paella. That something is called Hong Kong-style really doesn't mean too much and, if you are interested, information about all eight of the regional cuisines of China can be found here. Samples of all those cuisines can be found in Hong Kong. Generally speaking, Hong Kong-style refers to any dish that is stir-fried and mildly spiced, much like Cantonese food here in the U.S. This is a quick and easy way to prepare broccoli. It is also delicious and works well as a side for non-Chinese meals. If you are looking a new way to prepare broccoli, I think you love the crispness, color and taste of this one. Here's the recipe. 1) To prepare sauce: Combine water, oyster sauce, wine and cornstarch in a small bowl. Mix well. Set aside. 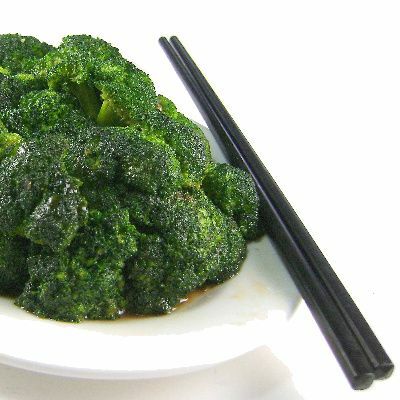 2) To prepare broccoli: Heat wok or large frying pan. Add oil and heat until it shimmers. Add garlic and ginger and stir-fry until fragrant, about 30 seconds. Add broccoli and stir fry until bright green. Add sugar and salt. Pour in water, cover pan, and cook for about 2 minutes. Make a well in center of pan and pour in sauce. Stir until thickened. Toss broccoli in sauce. Transfer to a serving bowl. Serve hot. Yield: 4 servings.